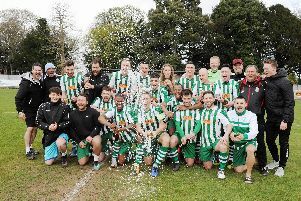 East Preston Football Club head coach Paul Ettridge is hoping Tuesday’s 3-0 win at home to Shoreham can spark a survival surge. Dan Huet netted twice and Kris Harding also scored as EP claimed just their second Southern Combination League Premier Division victory of the season. The win, coupled with Hailsham’s 6-1 home loss to Wick & Barnham United, means EP have moved level on points with third-from-bottom Hailsham. Wick’s win moved them ten points clear of EP but with just eight games to go, Ettridge is hoping his side can pull off the great escape. He said: “If I’m honest, this win has been coming in recent weeks. We’ve signed some players on and have played well for 60 minutes in matches without getting the wins. “But everything came together for us and I’m delighted for all the boys, especially after their efforts. “These are the games we need to be winning, though. We’ve got Hailsham next and we want back-to-back wins. “Obviously, we’ve only won twice all season but hopefully we can put a little run together now and spark a survival charge. EP made a fantastic start and were two goals to the good with less than ten minutes on the clock. The hosts took the lead on three minutes when Scott Johnston’s slip allowed Harding in and the forward took his chance with a clinical finish. East Preston doubled their lead four minutes later. Neat passing between Alex Wilson and Huet saw the latter race away and his left-foot strike nestled in the bottom corner. Michael Belli was Shoreham’s main threat and he wasted two gilt-edged opportunities. First, he somehow managed to head over from three yards after Craig Goodsir’s cross picked him out on 32 minutes. Then four minutes later, EP failed to clear their lines but his shot struck a post with Reece Markwick well beaten. Mussels showed some signs of improvement in the second half but were caught on the counter with 58 minutes played. Harding was sent racing clear before he cleverly cut the ball back for Huet to slot home his second. Shoreham pushed for a late momentum-booster but Steve Betancourt saw a 25-yard thunderbolt strike a post, while Belli headed wide again as EP recorded just their second league win of the season. Shoreham’s players arrived just ten minutes before kick-off following an accident on the A27 but manager Simon Funnell said his side had no excuses. He said: “That performance was just not acceptable and, if I can bring players in by Saturday, I will. “You just simply cannot have that. Okay, preparation was not great, but we started slowly and they just wanted it more than us. EAST PRESTON: Markwick; Woodward, Coulson, Pittock; Jenkins, Atterbury, Wilson, Mottershead, Cockerton; Huet, Harding. Subs: Ashworth (Coulson), Chikowore, Laughlin (Jenkins), Hall (Harding).